Born at the foot of the picturesque Ozark Mountains, famed in song and legend, in the town of Boonville, Arkansas. Irish-Danish descent. Attended high school in Booneville, Ark., where he starred in baseball, and his catcher was none other than his twin brother, Vernie, whose first name is the same as Floyd's middle one. What a drawing card if they had both gone into professional baseball. 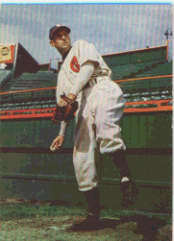 Started his professionsl baseball career in 1938 in the Cotton States League. Has been with Chicago White Sox, St. Paul, and Milwaukee. Came to the Oaks in 1946. Won 11, dropped 8 with the Acorns last season. His boyhood favorite was Dizzy Dean. Likes the Red Sox and Brooklyn Dodgers in the majors. Enjoys hunting. Floyd's ambition is to bag the limit of wild turkeys. He says these birds inhabit his part of the country, but he has yet to bag his first one. 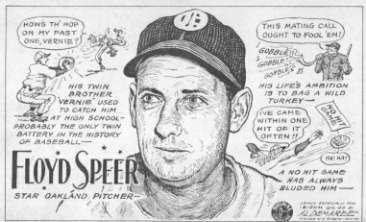 Professional Baseball Experience: 1939-40, Monroe, Cotton States League; 1941-42, Shreveport, Texas League; 1943, Chicago White Sox, A.L. ; 1944, Chicago and Milwaukee, American Association; 1945, Milwaukee, American Association; 1946, Oakland, P.C.L.